The BD200 is a powerful discharging device that allows the user to discharge a battery at up to 30 amps or 200 watts and also measures and compares the performance of batteries. 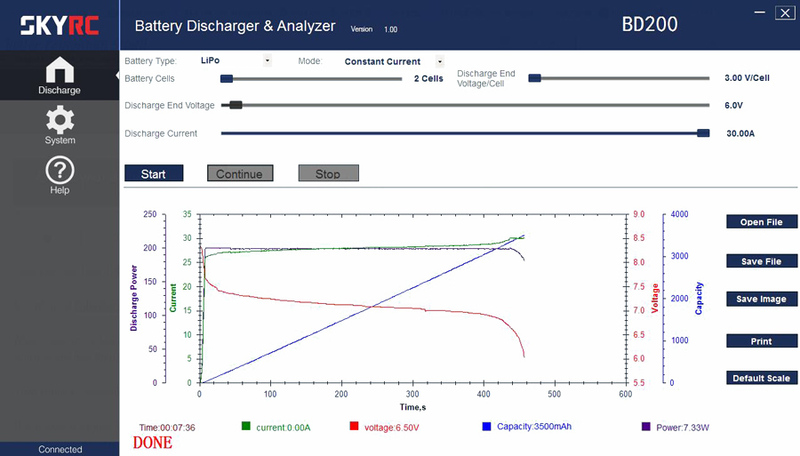 Using a designated discharger saves stress on your charger and goes much faster than what most typical chargers can discharge at. The BD200 allows for the precise measurement of battery capacity and takes the guesswork out of choosing the best battery for your application. The BD200 is much more than a simple battery discharger or a battery load tester. It will test virtually any type or size of battery, any chemistry or number of cells, up to 35 volts. It is small with a high-performance cooling system and uses MOS fets from the well-known brand IXYS, to make sure it can discharge at 200 watts continuously. A rotary dial on the front simplifies your operation along with a digital LED display to provide clear information. PC software supplied with the BD200 is easy to use, intuitive. The software can automatic sensing of battery cell count and recommends a minimum safe discharge voltage. Discharge tests may be viewed in Amp Hours, Watt Hours or Minutes. Results can be graphed as Voltage vs. Amp hours, Watt hours, Minutes. 6-30S NiMH/NiCd and 6-32V Pb Battery.